Eliezer Lorne Segal (University of Calgary) was born in Montreal and holds degrees from McGill University (BA in Philosophy and Jewish Studies, 1972) and the Hebrew University of Jerusalem (MA in Talmud, 1976; PhD in Talmud, 1982). He is married and has three children. He has taught at several academic institutions in Israel and America, and since 1986 has been a member of the Religious Studies Department of the University of Calgary, where he holds the rank of Full Professor, and served as the department's Head from 1998-2004. He has been awarded numerous academic honors, most recently the the Helen and Stan Vine Annual Canadian Jewish Book Award. He has published ten books, ranging from scholarly monographs, of which the most recent is From Sermon to Commentary: Expounding the Bible in Talmudic Babylonia (2005); through collections of articles for non-specialist audiences; to a popular children's book. 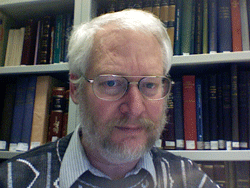 He has also contributed dozens of articles and book reviews to scholarly journals and collections, as well as numerous oral presentations. His popular web site contains many original teaching resources.